"2016 made 16 years of me silently battling with #BFRB (Body Focused Repetitive Behavior). I had no idea what it was however I knew it became worse as I was going through my separation, divorce, healing, to WHOLEness! Although last year I still struggled with allowing certain uncontrollable situations and people to get to me I began to do more for ME because I LOVE me and attacks on my skin are attacks of the enemy! He wants me to down, insecure, have low confidence, etc. but not me devil!! So I CHOSE me by: Drinking more water, going (for the most part) gluten free based on a dr.’s recommendation, biweekly mani/pedi’s, getting massages more frequently, washing my face with all natural products, exfoliating my face using all natural products (sugar, coconut oil, honey and aloe Vera), not putting make up over open wounds trying to cover them but allowing them to breath, putting bandages on my face at night during idol time when my hands would roam, keeping 100% vitamin oil close by and my fingers far away from my face, stressing less, loving more, reading more, praying more, FOCUSING MORE ON ME! And I have to say November 2018 to now have felt like my PRIME! And I plan on it continuing! SO, here’s to US not allowing anyone or anything to effect our PEACE!! 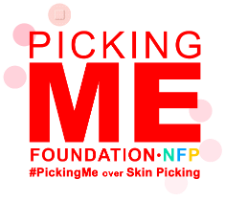 @pickingmefdn Thanks for this campaign! Although it’s “hard” to put your “stuff” on display, it’s therapeutic!! We have to deal with those things that hold us back! Click here to read more #ShareYourStory's or to submit your own!